I grew up just outside of Detroit. Only about thirty minutes from the heart of the city, but less than five minutes from one of the border lines, yet I also lived in one of the whitest cities in America. This isn't allegory. It's fact. The school that I went to wasn't of this vast landscape of wealth and business. It was a little-almost-forgotten corner of the suburban sprawl. It butted up to another similar corner of another city, then to another corner of a city that was quite a ways more like the Detroit you've come to know on the TV. Had my parents bought house two doors to the right of where we now live, we would've gone to the same ginormous (I love that that is officially an Oxford-English dictionary world) school district they went to, where graduating classes boasted anywhere from 400-800 people and where a few of my friends who went there had to contest to making friends with people all over the building, because they wanted to, but because the school was so expansive, you'd never make it to your assigned locker in advance, so you had to make friends you could share with that were near your different classes. One of my friends had FOUR lockers. Meanwhile, my locker had ventured across the middle school and high school buildings my entire time there, but I was ALWAYS between the same two people, one of which happened to love to just bathe himself in cologne between every class. There were lots of things afforded to us as small school students that I KNOW I wouldn't have had the chance at had the situation been reversed. I was a big fish in a small pond and I milked that old adage for every cent it was worth. But there was a price to pay. Living in a little community like that opens you up to all kinds of criticism and doesn't allow for a whole lot of privacy. I was a book smart person, at least when my anxiety wasn't clinging to my brain. And everyone knew my business or thought they knew my business or thought it was their job to know my business. It's part of what happens when you're best friends with the town's Golden Boy, too. A Golden Boy full of mysteries and always a line to get him, like taking a number at the deli counter. In short, I grew up in a community a lot like our main character Romy's. And I had been sexually assaulted the eighth grade. A problem that -- according to most parents and students -- wouldn't have happened if I'd just given that boy a hug like he'd wanted. Of course they weren't there when he cornered me during my independent art study period and felt me up. They weren't there when he hunted me through the hallways and I hid in bathrooms and stood on the seats so he couldn't see which stall I was in. It wasn't until someone I thought was a friend saw -- a Golden Boy if there ever was one -- and told my cheerleading coach that the school finally believed me and got the cops involved. Unluckily, many years after I graduated from that small school, with the small hallways, the small people, and the small minds, I was raped and sodomized. He kept going when it hurt and I said "no," and "stop," and "please." I won't say who, but I think you can guess. My Golden Boy. My knight in shining armor. He abused me, mentally and physically. Because he'd started grooming me to believe I wasn't good enough to be loved by anyone else. And I knew once he did it that even if I had picture perfect evidence that he did it, I could never charge him. Because no one took me seriously the first time. Why would they take me seriously the second time, when it was someone with much higher standing in the community? Because "boys will be boys." Mostly, Romy just wants to outlive it all and be left alone. I know that feeling. I realize that this has been less than a review and more my story. But that's why books like All the Rage are important. Because they give real people a story that resonates with them, that they can relate to, and that can help them realize they are not the only ones. All the Rage is the story of so many girls. And in this political day and age when the rights of women and girls are up for debate and when the "boys will be boys" motto seems even more prevalent, especially when you have a president who brags about going around and grabbing pussies (just "locker room talk," of course, no big deal) these stories are all the more important, no matter when or where they happened! I firmly believe with all my heart and soul that during some of the time that we pay our lawmakers for working -- our representatives, our senators, our cabinet, our Supreme Court, and yes, even our president, if he can understand all the big words -- should go towards a mandatory reading of All the Rage. There are women on Capitol Hill who will identify with this story. There are more women still who will champion it -- and some men, too. Because even though it is a work of fiction, we all know that stories like this do indeed happen. I believe some politicians will, if they let themselves, have their eyes opened. I believe it should be required reading for high schoolers. And maybe, just maybe, a few more people will stop seeing our president as the Golden Boy. 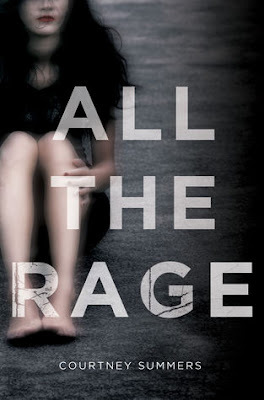 I wept while reading All the Rage, which is a testament to how accurately I felt and how much I saw myself in some of Romy's feelings, thoughts, and stories. And I weep knowing that we live in a culture where our young girls need to have these types of books to turn to to know that they are not alone. That said, I can't give it anything less than five hearts.